Spring is in the air! And boy, that’s what makes A Sea Scout smile until their cheeks hurt, doesn’t it? It’s a time to celebrate. Winter is over, the weather is getting better, and… The boats can go out to sail again (and many other water activities of course)! Do you have a similar event at your local group? What’s it all about? Feel free to share your pictures or video! It’s been six months since we’ve been elected as Odysseus Group 14 at the 14th edition of Eurosea in Barcelona – and we haven’t just been chatting on skype and sipping tea. 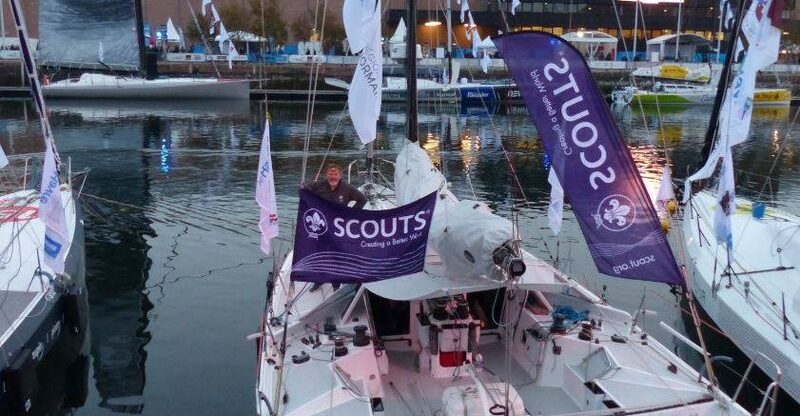 It’s time to update you on what we have been doing for Sea Scouting in Europe. Our dear friend from the other side of the world, Ron Bird, pitched the idea of writing out the history of Sea Scouting in Europe, Eurosea and the Odysseus Group. And we loved the idea – that’s what you get when two archaeologists are put together in a Sea Scouting team. Especially David has been putting a lot of effort in this project. 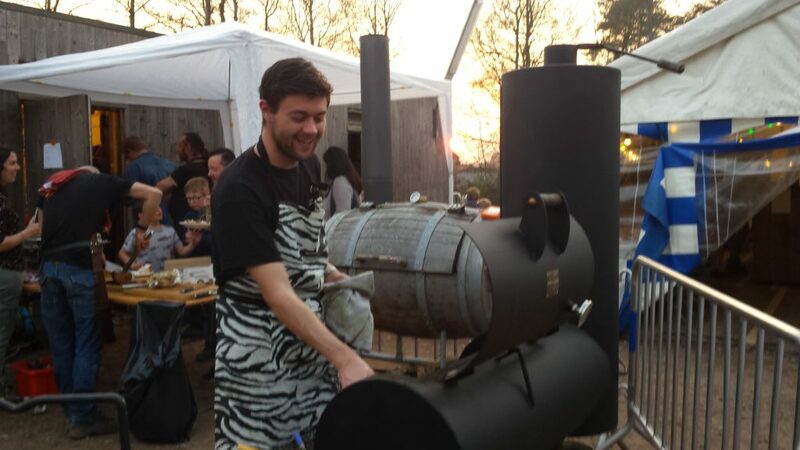 If you want to get in touch on a related subject, events, anecdotes, pictures,… please do! In order to keep connections alive and everybody informed on different things that have been happening we’ve been actively working to keep the blog alive on a weekly basis. Also other improvements are in progress: whatever we’re working on can be found on the Links & FAQ page. Jan is working on the ambassador system, how to improve it and more connection opportunities. 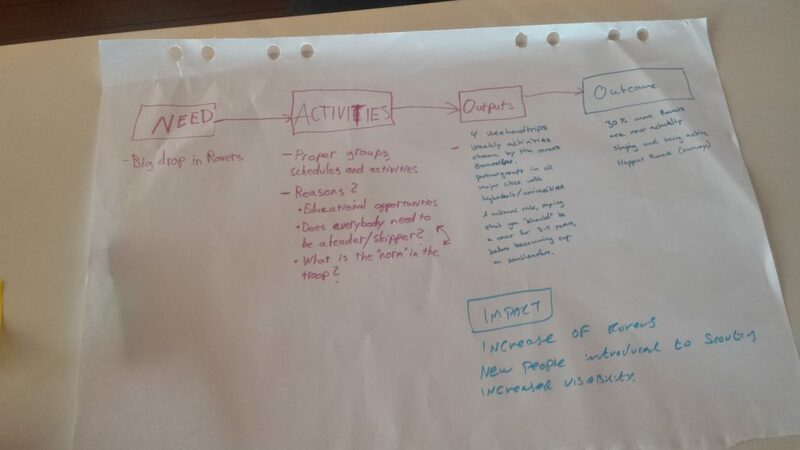 We’re working on ways to collect and spread as much information on Sea Scouting in Europe as possible. In order for that to work with privacy laws, we’re making everything GDPR-friendly. We’ll be visiting the venue for Eurosea 15 in the second half of 2019. In the meanwhile we’re making sure we’ve got our planning straight and we’ve started working on the program as well. Electra is keeping the communication with the hosting team going nice and smooth. If you already have an idea on a workshop you would like to accommodate or attend, please let us know! New team, new winds! A big welcome to the Odysseus 14 team. We would like for you to get the chance to get to know us a little better. Hello! I’m Thaïsa (aka Seal) and I’m very happy to be a second-rounder at the Odysseus team. 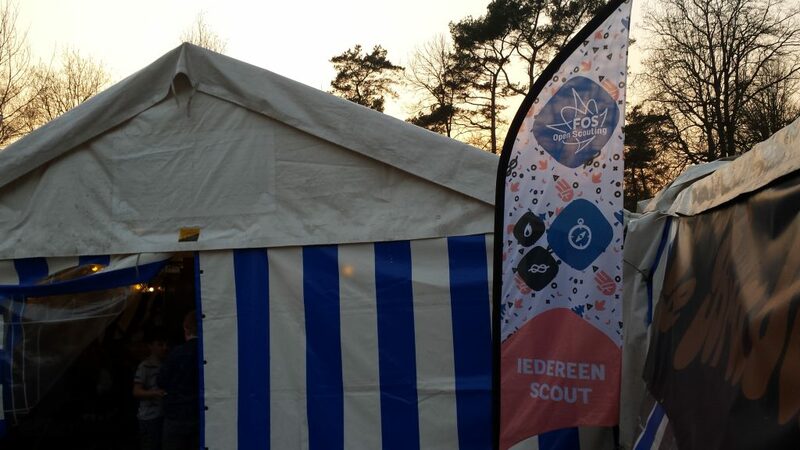 For people who don’t know me yet: I’ve been a member, leader, rowing and sailing trainer, board member and chair of Sea Scouting in Belgium (FOS Open Scouting). 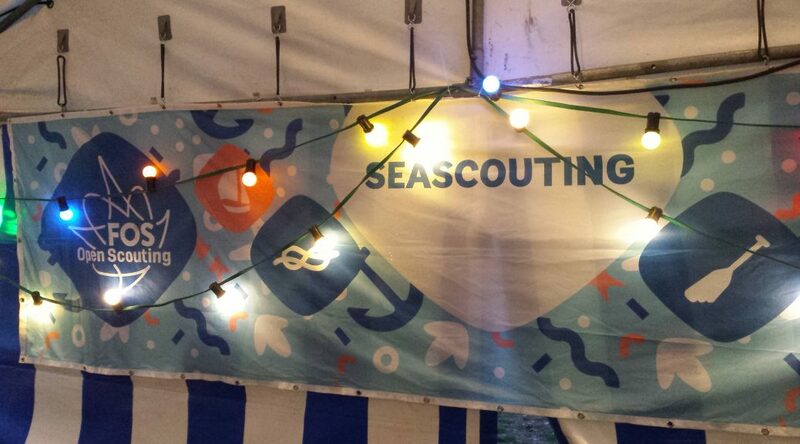 I’ve also been an International Commissioner for a while, but my heart has always been with Sea Scouting. That’s why I now fully commit my Scouting time to the Odysseus team and I won’t have many other Scouting commitments aside from giving a workshop here and there in the next two years. I’m hoping we can deliver a great Eurosea edition in Greece and connect and inspire as many Sea Scouts as possible in the mean time! 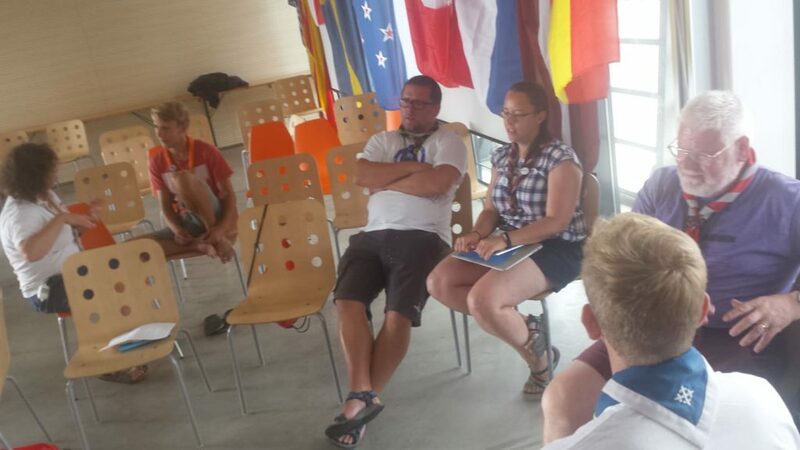 Asta is head chief of Sea scouts in Lithuanian Scouting organization. Working with a team of wonderful sea scouts to create an adventurous and interesting sea scouting experience for our members, also to make sure that we prosper and grow. Furthermore, Asta is a member of Ethics Committee in Lithuanian Scouting organization to keep an eye on those scouts who do not behave in accordance with our ethics, values and morals. Hello my name is David Wraight and I’m pleased to be joining the Odysseus Group to deliver Eurosea 15 and further develop Sea Scouting in Europe. I’ve been an adult in Scouting for 45 years with roles with different age groups, and roles with local and wider responsibilities in the United Kingdom. 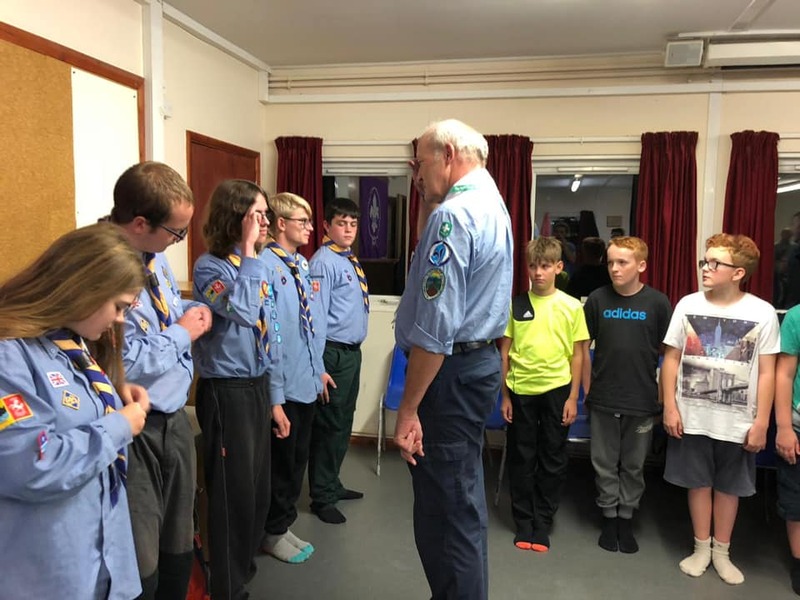 Currently I run an Explorer Sea Scout Unit (14-18 years age range), am an international commissioner and have other roles around mountains, water activities, leader training, international camps and international expeditions. 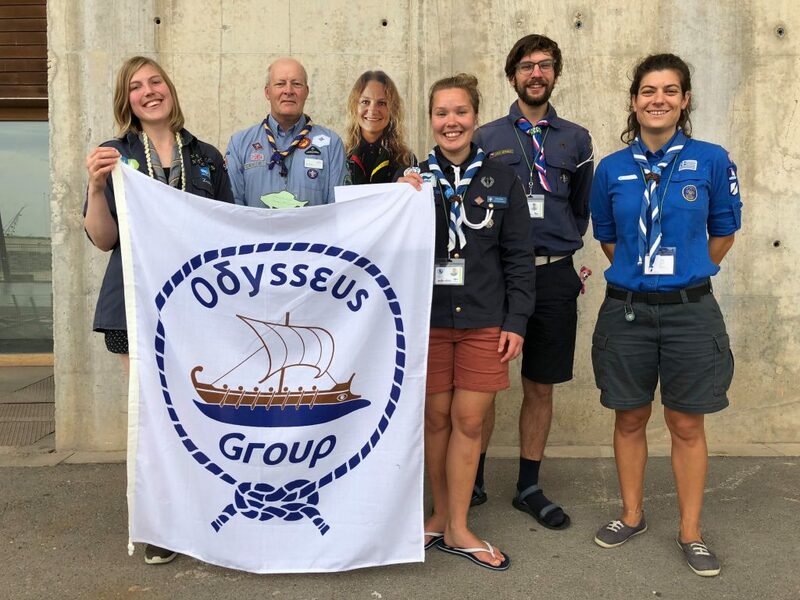 I am enthusiastic about Scouts having great international experiences and look forward to working with the Odysseus Group in developing more opportunities for sea Scouts across Europe to share experiences and learning. I’m a Finnish Sea Scout living in England. I grew up sailing in the unique archipelago of Turku and around the Baltic Sea where I still skipper yachts and train scouts. 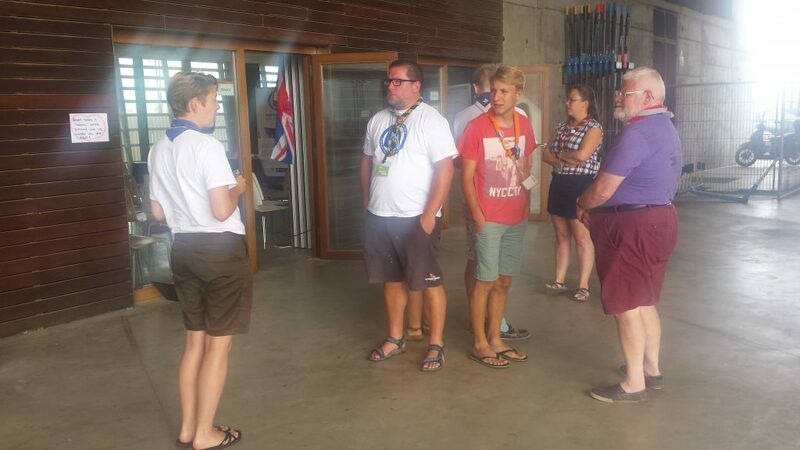 Shuttling between two countries has made me see the potential we have in Sea Scouts internationally. 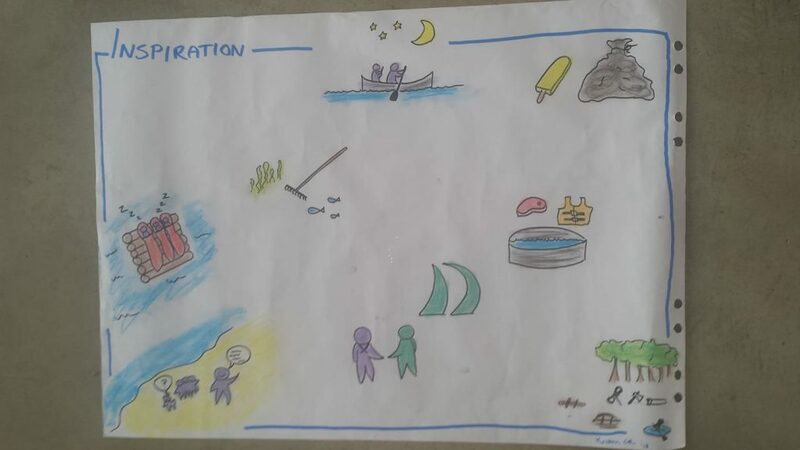 In the Odysseus group I want to do my best to build connections to facilitate the sharing of ideas and practice between Sea Scounts across Europe. In two years time I hope we have more collaboration between countries, new international Sea Scout projects and more great experiences in doing things together! I am in the scout movement since 1995. I was a Scout leader for 5 years, a Venture leader for 2, and now I am a Rover leader. I am also a skipper and skipper instructor. At the moment I am organizing the Greek Contingent Team for the 24th World Scout Jamboree as an assistant leader. I have also participated in two world scout Jamborees and several other international Scouting events. These Sea and Tea Scouts are based in the United Kingdom. Surprising? Not really. Tea has been a prominent feature of British culture and society since the seventeenth century. Though it used to be a luxurious drink only affordable by aristocrats, it is one of the most accessible food crops in the world these days. 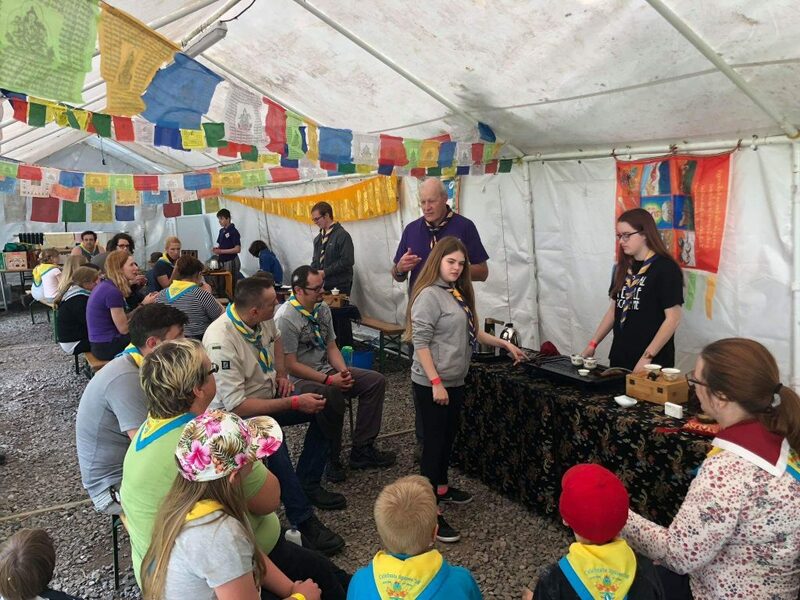 The 38th & 40th Stood Explorer Sea Scout Unit in the United Kingdom is one of the most active Tea Scout groups in the U.K. On 6 October 2018 the eight Explorer Scouts of the 38th&40th Strood Explorer Sea Scout Unit were awarded a World Organisation of Scout Movements World Bar on the recommendation of the World Scout Buddhist Council in recognition of their work in promoting tea ceremonies as a vehicle for faith or no faith discussion. Their linked Global Tea Scouting project is now live in 14 countries. 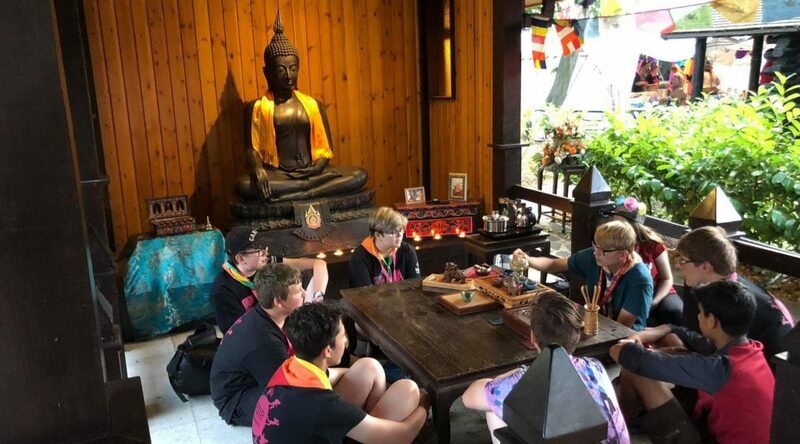 Explorer Scouts of the 38th&40th Strood Explorer Sea Scout Unit were awarded a World Organisation of Scout Movements World Bar on the recommendation of the World Scout Buddhist Council in recognition of their work in promoting tea ceremonies as a vehicle for faith or no faith discussion. 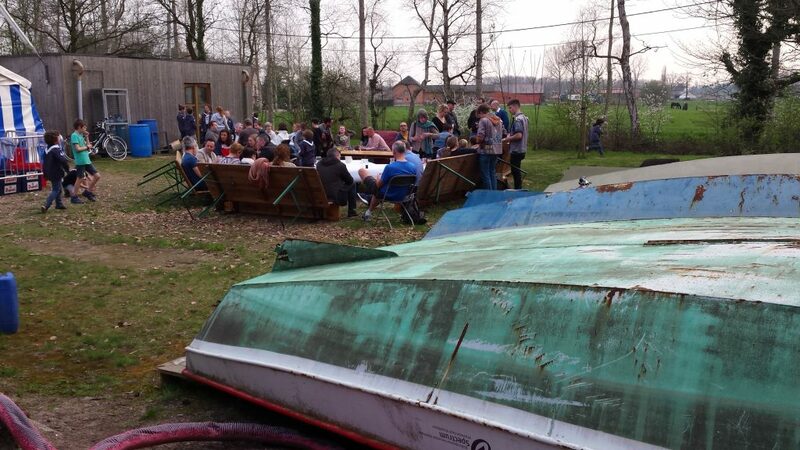 The purpose of the workshop came out of the core idea of a Eurosea event: to inspire people and share ideas. You can get really surprised; something that might be very basic for one person, might be very out of the box for someone else. The first part of the workshop was a little self-reflection. 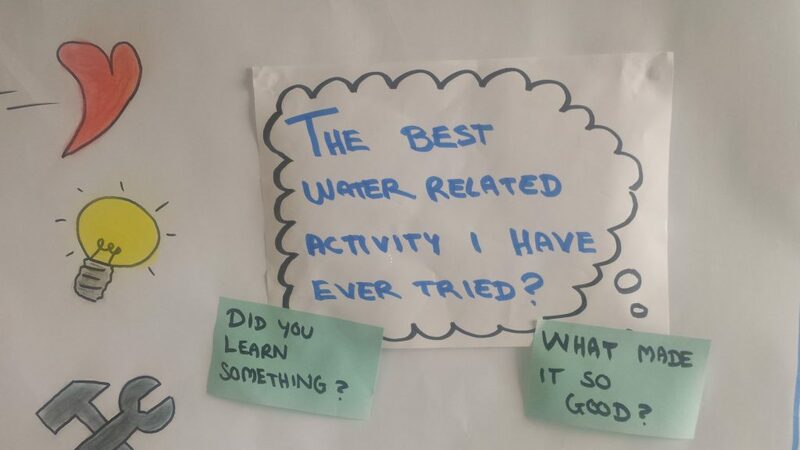 We had to think about the best water related activity that we had ever tried. Two questions that would help us were: 1. what made it so good? 2. did you learn something from that activity? This happened in complete silence – honestly, it was a nice surprise since most you do during Eurosea is talking to other people as much as possible. Surprisingly we did not have to share this immediately, so we were curious when and if something that would happen with this information later in the workshop. 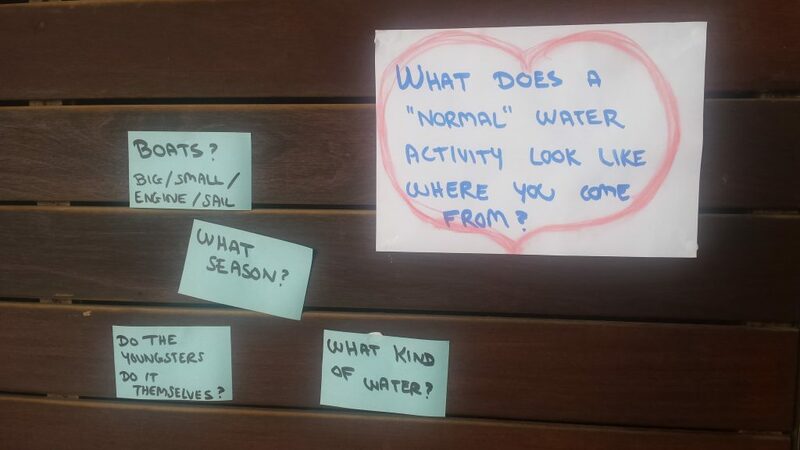 The next question we were asked was “what does a ‘normal’ water activity look like where you come from?” which we had to answer in the original form of a speed date. Kristine gave us some inspirational questions to get the conversation started: 2 minutes per speeddate, one for the inner circle to talk and the next minute for the outer circle to talk. It feel like after a couple of days you already know that Sea Scouting all over Europe is organised in a different way, but hearing it in detail from a couple of countries was quite cool! Doing physics test like “does it float?” to figure out what can be left loose and what should be fastened in a boat. Finally we got to share our results of hard mental labour. 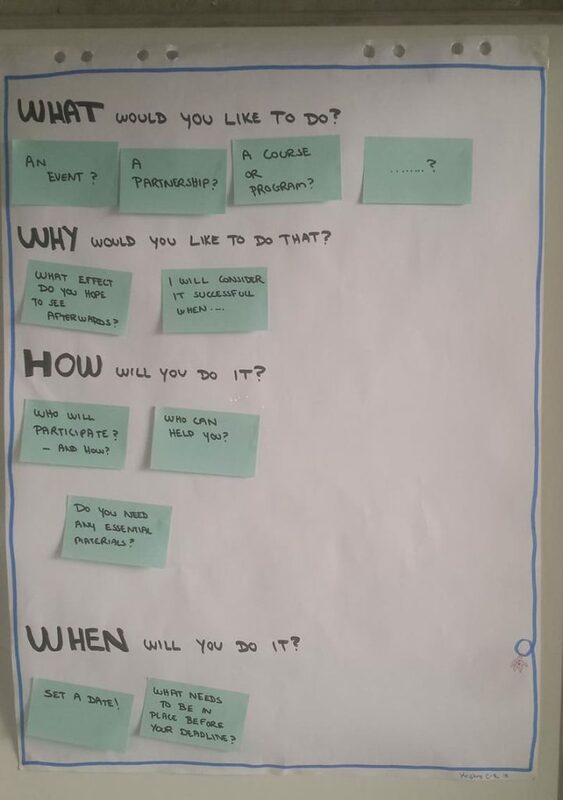 What would we like to do, why would we like to do it and even maybe already a when too! Mangus from Sweden would like to go ice sailing. It would be a (half) year project to teach the kids some planning as well. It goes from building the ice sailing boat to actually sailing it. He would introduce it in august so the youngsters have time to look up information and start the built. The finished product would be done by February or March to try out the boats they built! Chiara from Italy would like to an event for oldest among the cubs which includes actually sailing. 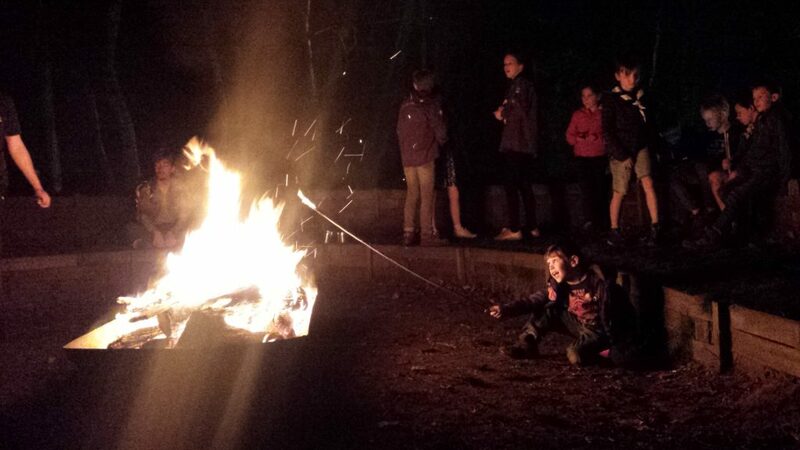 This is a thing cub scouts don’t do in Italy. 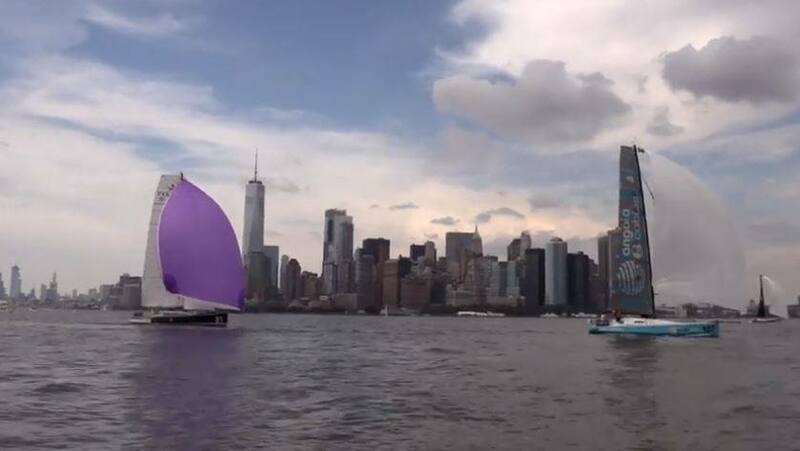 This would have to happen on a national level with a big emphasis on the pedagogical level, because sailing for cubs has not been used before in the program. She would like to wrap up the project in two years, by the end of her term. Sergei from The Netherlands would like to do something for their local groups. All his kids never went sailing on the lakes in Friesland, in the North of the country. So he would like to organize a group camp to go to Friesland. He actually had a phone call the day before this workshop and created a little task force to actually make it happen in the summer of 2019! I think we can say that we got very much inspired, just as the description of the workshop promised. 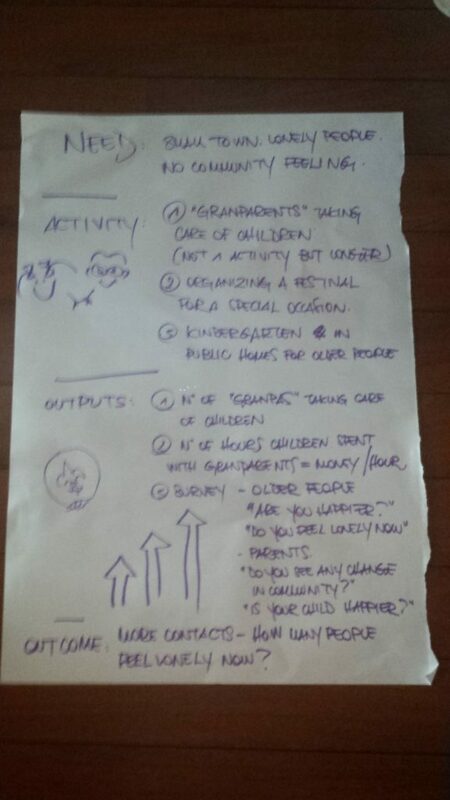 Some very lovely plans were created during this workshop. I definitely think it was the same case during other slots of this workshop. Thanks to Kristine Clemmensen-Rotne, Denmark, Chairperson of Odysseus 13 to prepare this original and inspirational workshop! Did you know the English word ‘posh’ has a maritime origin? It originated back in the day when ships didn’t have air conditioning. To sail to India was quite a voyage and the nicest way to spend it was sitting in the shade. Sailing South-East from England to India meant it was shady on the port side. Sailing back home the most comfortable place was on starboard side. These were spots only the rich people could afford. That’s when wealthy people were started being called posh: they were sailing Port side Out and Starboard side Home! Thanks to David J. Roy (Scotland) for sharing this fun fact! The terminology has to do with the structure of vessels, namely that they were asymmetric. Before ships had a a rudder in the middle of the ship, the rudder was placed on the right hand side of the ship (looking in the direction of where the ship is heading). 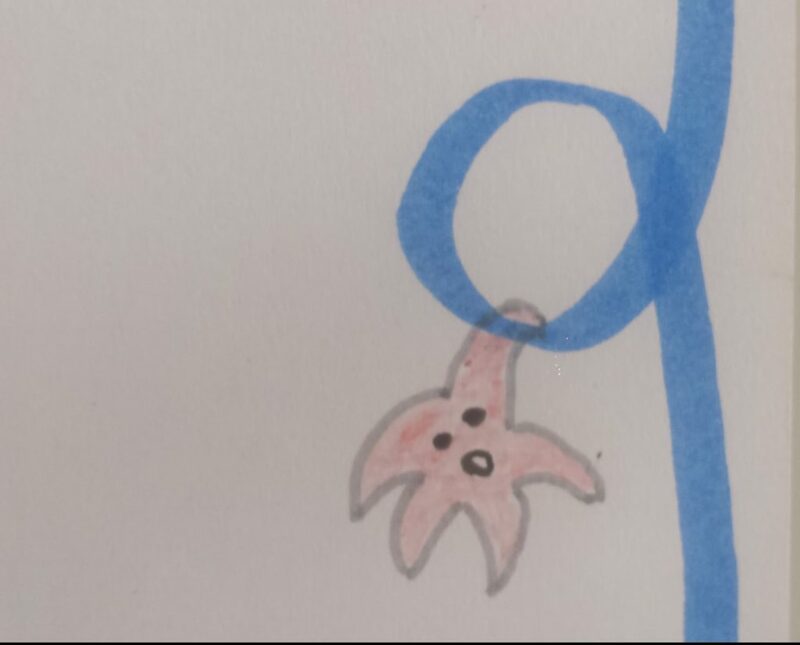 This was simply the case because the majority of the people were right handed. 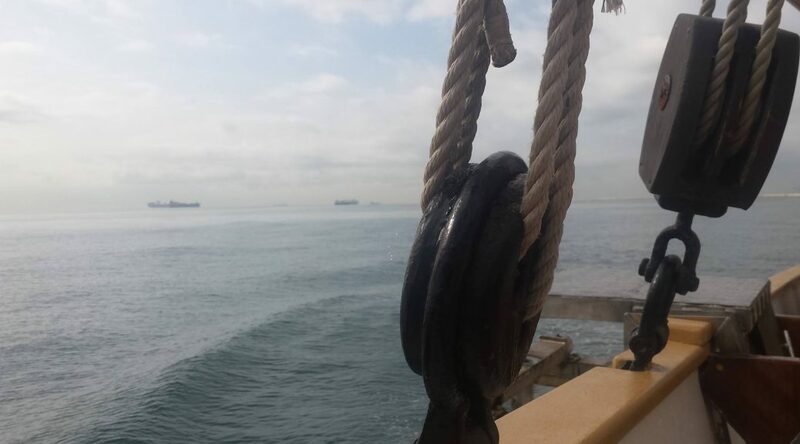 Since the steering oar was placed on the right hand side, the ship would tie up at the wharf on the other side because there was more place to access the ship. Hence the left side was called ‘port’. Formerly ‘larboard’ was used instead of ‘port’. This came from the Middle-English word ‘ladebord’. The term ‘lade’ is related to the modern word ‘load’. ‘Larboard’ sounded too similar to ‘starboard’, so in 1844 the Royal Navy ordered that ‘port’ should be used instead. In short: starboard side was the side of the ship where the steering happened, port side was the side of the ship that touched to quayside to load and unload the goods. Even in modern ships cranes are still placed at the port side even though the rudder is now placed in the middle of the ship. It’s true, google some pictures! Thanks to Kris Bauters (Belgium) for sharing this fun fact! Hopefully we’ll share many more conversations like this! If you have a fun (historical) nautical story or fun fact, activity or experience to share with the world, let us know through the contact form! 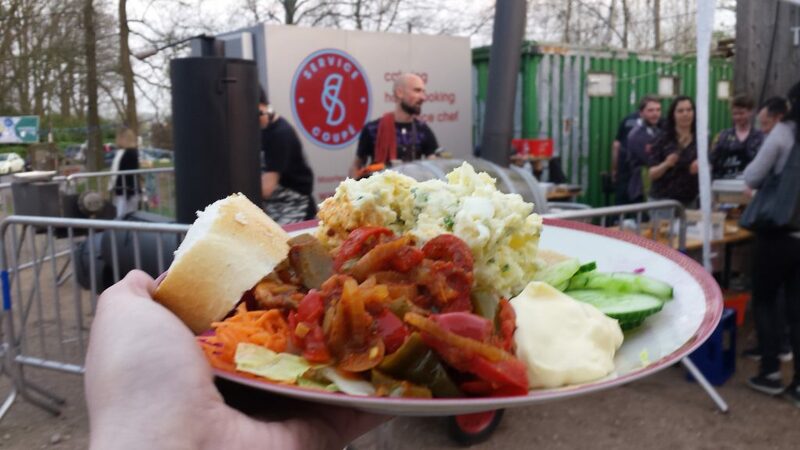 Because you may have noticed: we love to share! This is the story of three guys who were sea scouts wanted to buy an off shore racing boat. And so they did. They were passionate about the idea of participating off shore races. Together they bought a Class 40 and since they have participated is numerous big races. Just to mention, they’ve already crossed the Atlantic ocean four times. The name of the boat is ‘Esprit Scout’ (in French), which translates in English as ‘Scouting Spirit’. You can dream big and have many ideas, but being a Scout gives you the opportunity to turn those dreams into plans and eventually make them reality! The project has become reality thanks to a big community, because the Scouting Spirit brings the community together. Once a Scout, always a Scout. 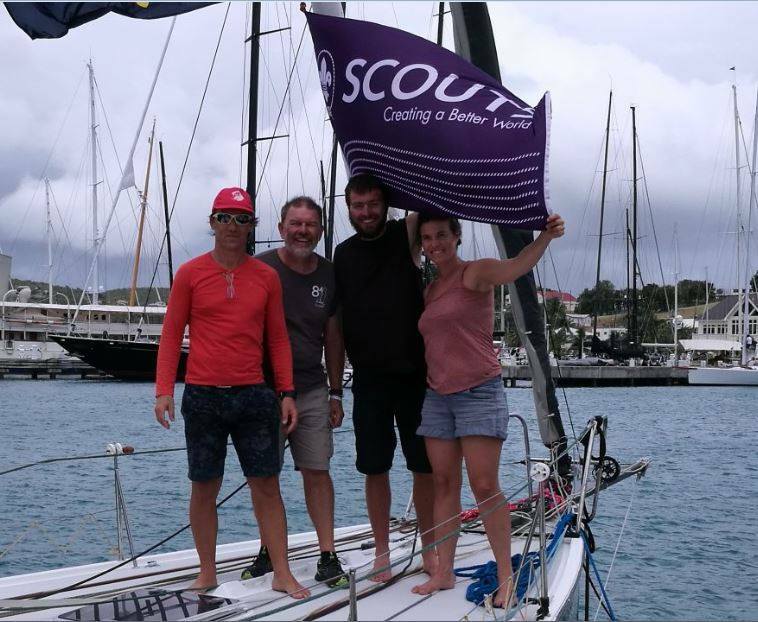 The sailors want to share the experience of sailing a racing off shore boat with other Scouts and the entire Scouting community. One thing you definitely have to do on an off shore race is work hard as a team to have a good race and ensure safety in an adventurous environment. One of the sailors has been an Eurosea participant! The projects is supported by WOSM. That’s why the WOSM logo is shown on the side of the boat. In honor of that Scouting Spirit have they have made a purple spinakker. Last year the boat has been sailing a lot in the Carribean, USA and Canada, where the crew has met meany scouts. The project is open to anyone who wants to experience off shore racing, both scouts and non-scouts. For now the last race will be in November 2018. But the team is open to continue when interest is shown. Which means that if you would like to go sailing with your Scout troop, you can surely contact the team! The ship can be a way of bringing people together, so anyone who would like to organize an international exchange program – this is definitely one way to do it! There’s several ways you can be part of Esprit Scout: the most important one is to go sail it and experience an unique way of sea scouting. 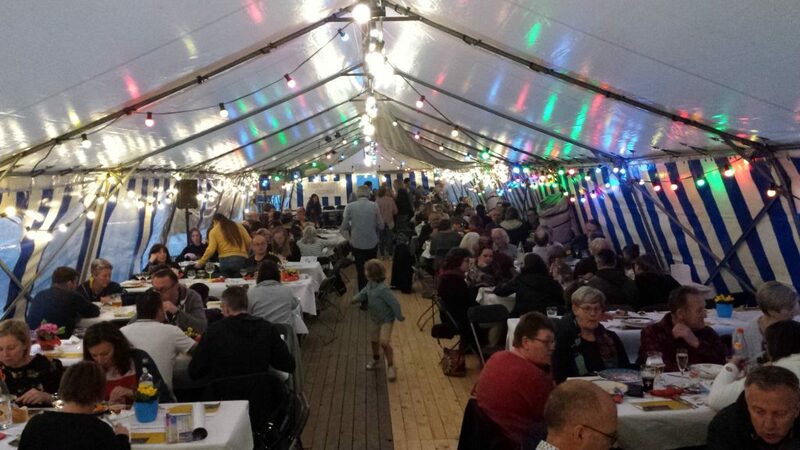 Further you can financially help sponsor the races: in stead of big sponsors the sailors have chosen to make the entire community part of the team. Every small contribution makes you part of the team. 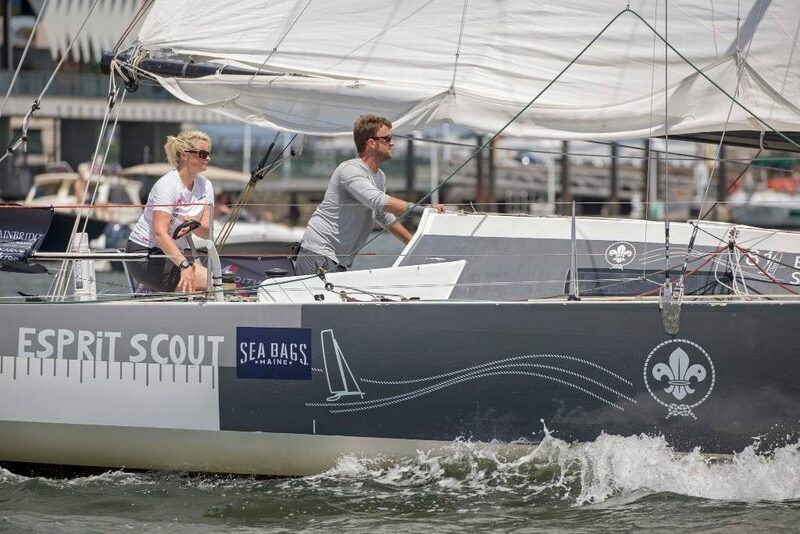 Last but not least: if you want to follow Esprit Scout and their latest adventures, please like the facebook page https://www.facebook.com/81Class40/ By liking the page, you also help to spread the project to your friends and family and give them an opportunity to experience Scouting Spirit in off shore racing. As tradition goes, during the Eurosea event the Odysseus team is elected. 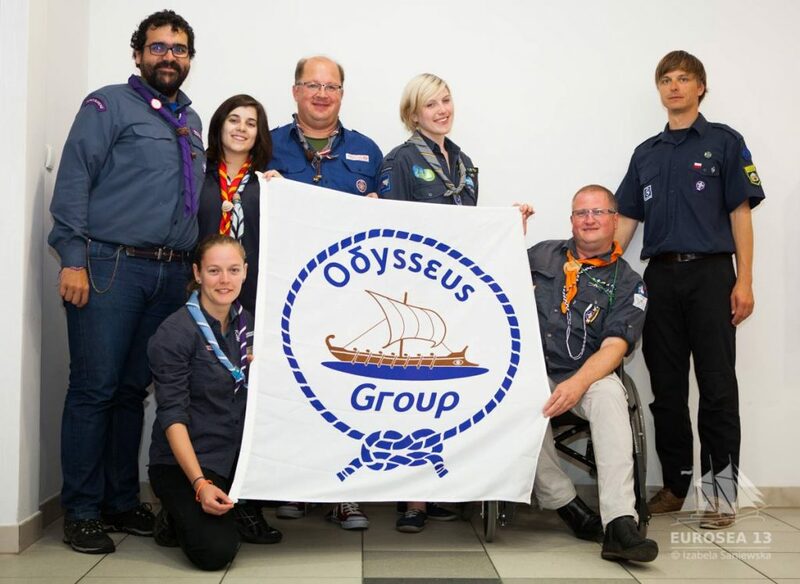 During the 13th Eurosea edition in Poland the last Odysseus team was elected. It was an interesting mix of people who were excited to join forces to organise the 14th Eurosea in Barcelona and share ideas along the way. Because of all different kind of reasons 5 out of 6 chose to not to stand for election again. Once again a big thank you to every single one of them to put in the effort they saw themselves possible to support European Sea Scouting. As far as goals go, I am very happy about us opening up to non-sea scouts so that more people can enjoy water activities. Professionally I will take some lessons learned from working in an international team for two years seated across different boarders. Last but not least I am very glad to have been part of planning a successful Eurosea in Barcelona. Thanks to the entire team for making it happen! During my time as an Odysseus member I got lots of energy out of being part of this team. Together we created some nice ideas, created a great project and we had a good time. In short, the brand new 13th Eurosea Odysseus Group that started out in Poland truly became my friends on the way to Barcelona. I loved working with a very kind and professional team. I learned a lot, and experienced so many intercultural topics. But most of all it was great being part of the team developing and designing an international seminar in Sea Scouting and seeing a great outcome. These two years have been both long and short. It has been a brand new experience that was worth all the hard effort we have put into it. It all began with joy and inspiration and ended with pride and satisfaction. I will remember this period for long time and hopefully it makes a difference in Sea Scouting in Catalonia. But, of course, it won’t end here. I wish the new Odysseus all the good and strength to carry on this wonderful lifestyle that we all get to experience. The past two years have passed unexpectedly quickly. It is good to work in an international team and still discover similarities and differences. Odysseus 13 is a very warm and cordial team. I am glad that my memory and accumulated experience from several previous Euroseas and sea scouting actions were useful. 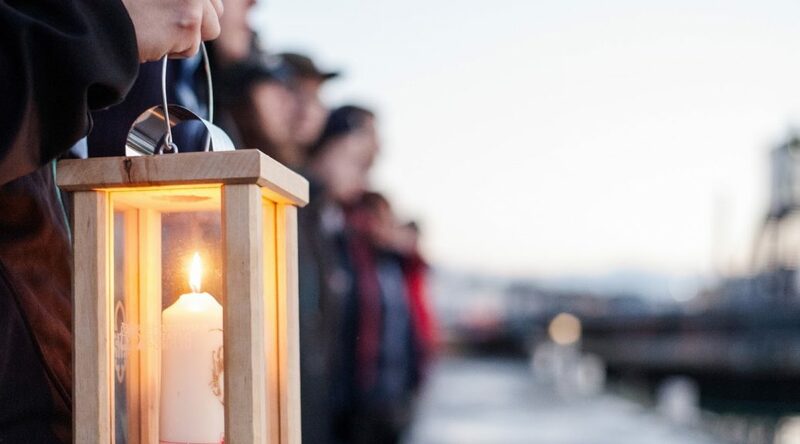 Since the last seminar many things have changed in my volunteering in sailing and sea scouting, I have more national responsibilities and that is why I’m hesitant. Even though this is not my final goodbye to Odysseus, this is my final goodbye to the 13 team. Meeting with this team was an inspiring moment every single time. The ideas we came up with as individuals became better when talking to the team. And even in my most difficult of times, they never gave up on me as being a part of the team. I’m insanely grateful to having been part of this team and taking many great memories with me. As Sea Scouts we all have a clear definition in our minds when we talk about ‘sailing’. But ‘Social Impact’ is a less clear subject and everybody might have a different definition of what it means. As scouts we promise to create a better world, but are we? Through our personal actions we have suspicions that we are, but are we really sure? The WOSM working team figured they had to find a way to measure the facts. 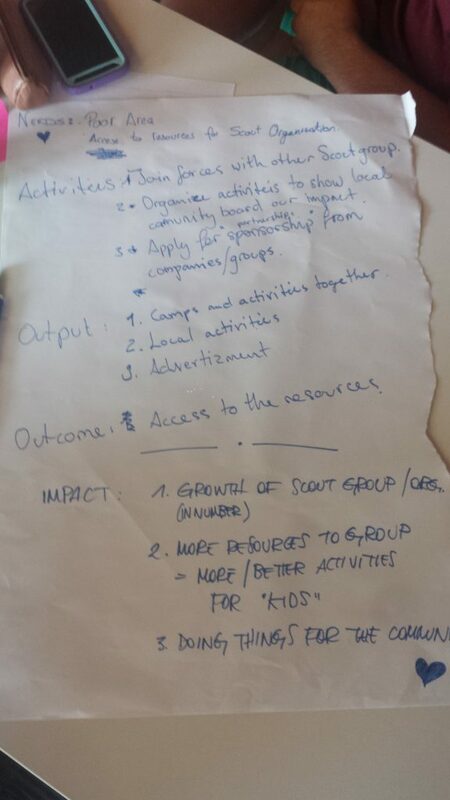 They are working with the definition of social impact as the following: effect of Scouting activities on individuals and communities. Right now they are developing a pilot tool to measure all different kinds of social impact. First being the personal level for example the scouting promise or a long hike. Secondly we are having a social impact on a community level, hopefully we are having a greater impact on the community when they experienced an impact themselves and learned from it. A third level is the institutional level, for example in Belgium the Sea Scouting delegates talk to the naval government to talk about regulations and making it safe for scouts to sail in trafficked water. In Italy the local scout groups talk to local policies and decision making, but the association is also taking a strong standing point in the immigration and refugee discussion. But also individual scouts who in their later careers become involved in decision making institutions as being their job. How is impact achieved? We create a project around the needs that provide themselves. 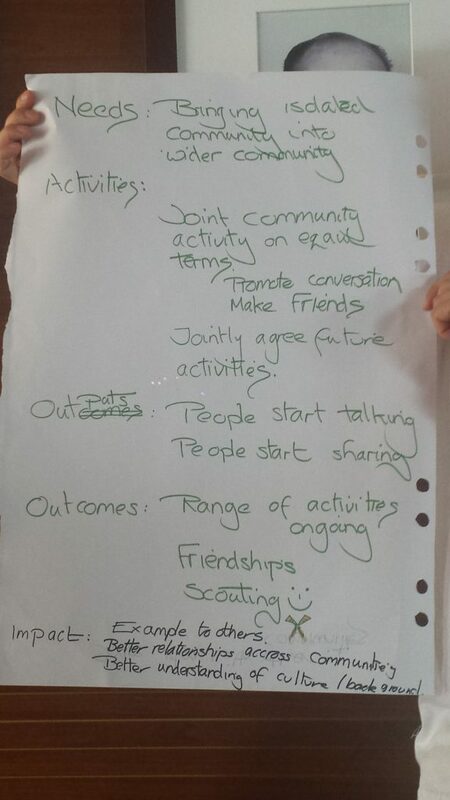 Based on those need we do activities and (hopefully) we create positive outputs. The effort of the activities can be registered and the result of these can also be registrated. What the eventual outcome of the project is can also be registered. However, what will the impact be of the outcome? Is the impact for the better and is it long lasting for the greater society? For example scouts cleaning the beach. Sure, the outcome is a clean beach for a while. But what creates the impact? The children will be more aware on producing trash, and there might be people who have seen the scouts cleaning up the beach and might be inspired by their actions. …..
We need to be able to prove that the impact and the change is there because of our Scouting actions. How do we actually know we are achieving impact. We all know we are great in achieving impact on personal experiences and there is plenty of anecdotal evidence. But the other thing is hard data. How could we make that happen? This particular workshop was followed by 12 participants. They were divided in three groups and were presented with a problem and asked to provide a way of measuring social impact through the solution they came up with. Underneath you will find the notes of those four groups. Present work on social impact has a two-fold objective: the development of a measurement tool, and advocacy work on the concept and the importance of taking it into account. There is a strong believe that planning any project or activity taking its further impact into account has a direct positive effect on the quality of said projects and the time and resources ultimately devoted to it. Thanks to Tomàs Genís Galofré, International Commissioner for the Catalan Federation of Scouting and Guiding and Team member of the WOSM European work group for Social Impact for providing this workshop at Eurosea 14. Be the first to get news from fellow sea scouts and stay up to date on the Eurosea event!